We celebrated a big birthday around here recently (big because they're all big at this age :-) when a certain someone turned THREE! How can she be three already? I have a feeling I'm going to be asking myself that same question as every year passes. 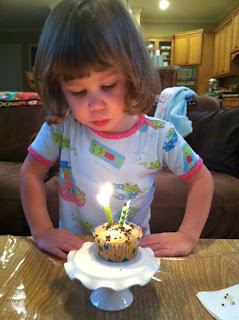 We started the big day out right with Chocolate Chip Muffins for the birthday girl, with candles of course. I told myself it was better than just letting her eat chocolate chip cookies for breakfast but that's debatable.What wasn't debatable was how yummy they were! Combine the above (dry ingredients) in a medium size bowl and whisk to mix. In a large mixing bowl whisk together the wet ingredients. Then with a spoon stir in the flour mixture until just combined. Then add 1 C semisweet chocolate chips. Fill paper lined cupcake pans about 3/4 full. 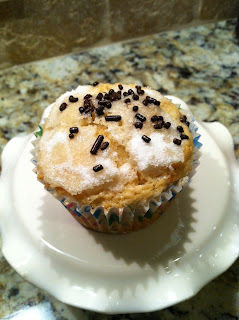 Sprinkle each muffin with about for that nice crackly top. I also added a few chocolate sprinkles because it has been the summer of sprinkles around here. Bake 22 - 25 minutes at 375 degrees or until golden brown and A toothpick comes out clean. Cool in pan 5 minutes then finish cooling on wire rack.